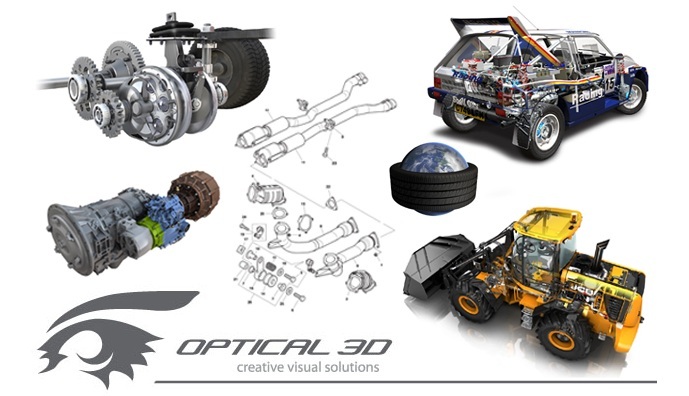 Optical 3D Limited is a Technical Illustration and 3D Animation Company. With a team of illustrators, designers and animators, all with engineering, technical or scientific backgrounds, they have been working directly with companies in the Automotive sector for the last 10 years. They deliver a wide range of services from high quality technical publications, incorporating line drawings, technical authorship and in house digital printing, photo-realistic 3D ghosted and cutaway images for marketing materials, to interactive training materials and Apps. They specialise in producing highly accurate and detailed 3D animations used to convey complex products and processes. By using their technical understanding and the latest software, they make maximal use of all available resources, including existing 3D CAD, to produce stunning visual images and animations within an affordable budget. Although many clients come to them with a defined brief, the team are equally happy working alongside companies, understanding what they are aiming to achieve and then producing the best creative visual solution, on time, on budget and to maximal effect.